To improve digital transactions, the ministry of electronics and information technology (MeitY) launched a 24X7 satellite TV channel named 'DigiShala. Digishala 24 hour free-to-air satellite TV channel which is available now on DD Freedish and Dish TV. The channel will educate to peoples for cashless economy. However, as of now, it has only three to four hours of original content. 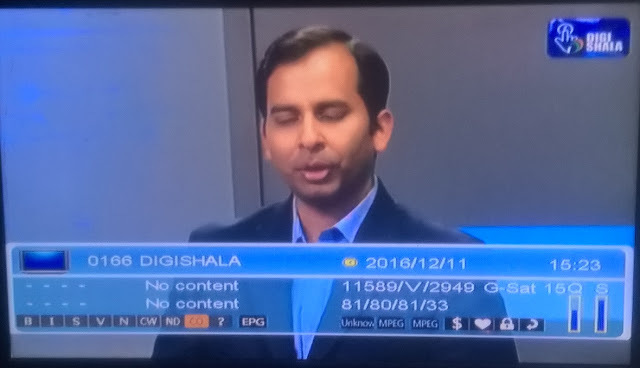 DigiShala is a free-to-air channel, broadcast nationally on the DD free-DTH service. To achieve the objective of educating, enabling and informing citizens about a cashless economy, the government has also initiated a 'Digi Dhan Abhiyan'. This channel can be receive by using free-to-air set-top box or by DD Freedish DTH. "DigiShala will enable and empower every citizen of the country, especially farmers, students, poors and women in rural areas, to learn the usefulness and benefits of digital payment in our everyday life," Ravi Shankar Prasad, the MeitY minister told reporters here while inaugurating the channel.